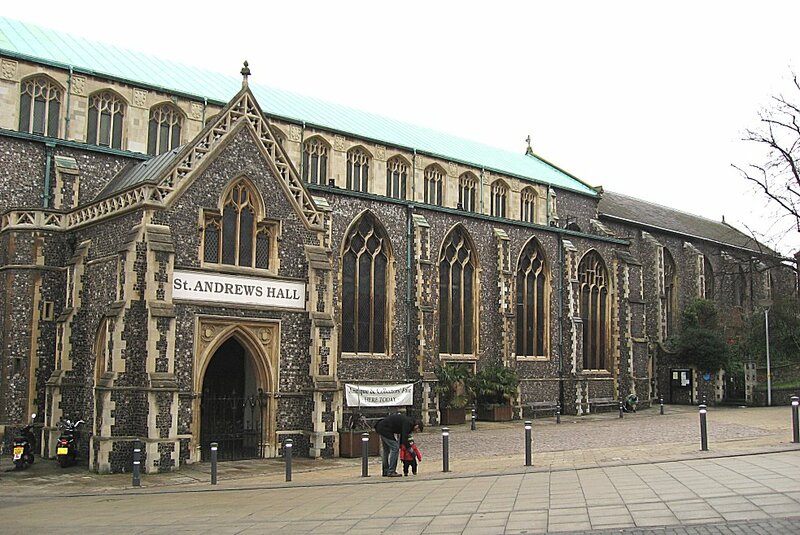 The history of organs in St Andrew's Hall starts in 1824, when three prominent Norwich citizens arranged for a single-manual organ by Gray & Davison to be installed in the west end for the inauguration of the Norfolk & Norwich Music Festival. 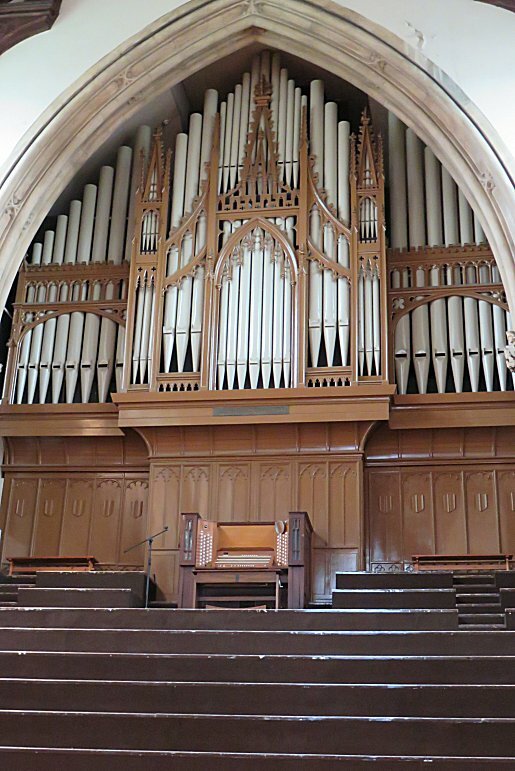 A pedal organ was added in 1836, but as a result of the Festival's growing importance by 1880, the original instrument was replaced by a new 3-manual organ by Bryceson Bros & Ellis. A complete rebuild & expansion was carried out by Wm Hill & Son, Norman & Beard Ltd in 1927. HN&B, maintainers of the organ since 1892 reported in 1975 that a major overhaul was necessary. Fund-raising started in 1980, and the work was completed in 1984. From left to right, Joseph Beech (organ scholar, London Oratory), James Lancelot (IAO President), Ben Bloor (then organ scholar, Westminster Cathedral), Keith Wright. During the 2015 Congress, this venue hosted not only the association's AGM but also a Masterclass given by Keith Wright, Head of Keyboard at St Peter's School and Director of Music at St Olave's, York. Works by Franck (Choral no.2 & Cantabile in B) and Widor (Choral from Symphonie Romaine) were played and discussed. 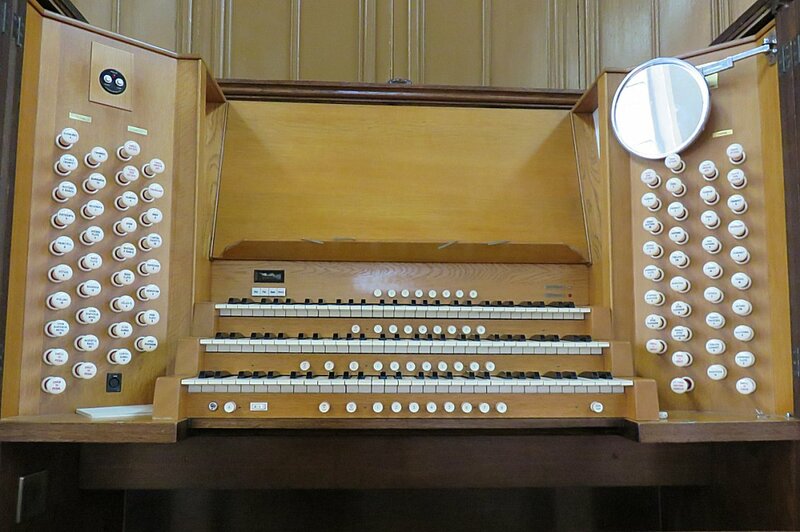 You can listen to Ben Bloor playing the organ of his Oxford college as June 16's Music of the Month.